Seventeen year-old Grey Alexander and her younger sister, Orinda, learn to survive after the loss of their parents in this fast-passed sci-fi thriller. In 2160, North America is under the control of a dictatorship that uses technology to its advantage for controlling humans and their actions. Before their mysterious disappearance, Grey’s revolutionary parents take their children into hiding to avoid having them become electronically “connected”. Only Mrs. March, a trusted, elderly, family friend, knows the girls’ secret, and she will stop at nothing to protect them. While reading Jupiter Winds, I couldn’t help but compare it to The Hunger Games. You have two sisters who draw on their courage and determination to survive through the loss of a parent; the government of the futuristic country has fallen into the hands of a dictatorship known as Mazdaar; and the girls are forced to smuggle and trade contraband in order to survive; however, that’s where the comparison stops. Travel from Earth to Jupiter has been reduced to a few days journey. But who would want to go to Jupiter in the first place? Certainly not Grey and Rin, that is until Grey is abducted for questioning by Mazdaar’s General Evangeline Yurkutz. The General is determined to uncover the truth concerning the whereabouts of Grey’s parents. 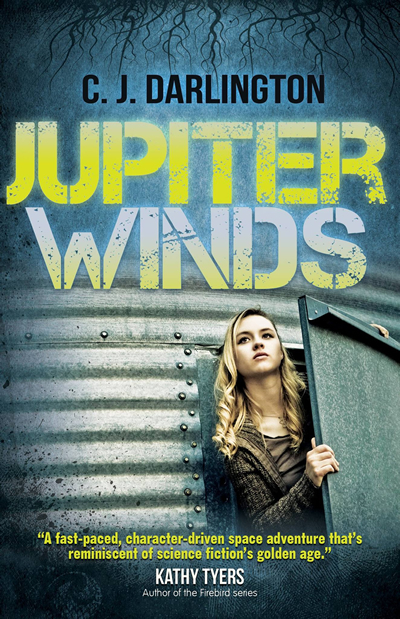 Jupiter Winds is an excellent read. With each turn of a page, our heroines encounter life threatening situations that seem realistic and impossible to escape. The transitions in this novel keep the action flowing, and I especially liked the way the point of view switches from Grey to Rin throughout the story. This is the first novel I’ve read from this author, but I will be looking to read her other novels and any in the future. I received this book for free from C.J. Darlington in exchange for my honest review. This entry was posted in Review and tagged a book a beach and a breeze, book review, Booklook, cj darlington, dianabusbyfreelancewriter, Jupiter Winds, mountainview books, reading, science fiction. Bookmark the permalink.